Wonderful staff. Will stay again. Warm and welcoming and the place was very clean. Where to find Canadian hotels near an airport? Where can I find hotels in Canadian that are near tourist attractions? Although there aren't any Expedia hotels in Canadian, there are 11 within 0.1 kilometres (0.06 miles). 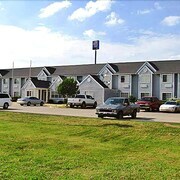 The Holiday Inn Express & Suites McAlester, Oklahoma, which is the closest hotel, is 30 kilometres (20 miles) from downtown Canadian. 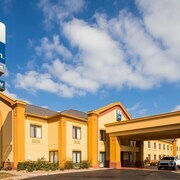 As an alternative, try the Hampton Inn & Suites McAlester, located in Oklahoma, which is 30 kilometres (20 miles) away. 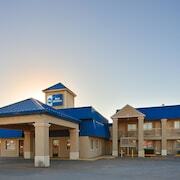 The Comfort Suites McAlester is 30 kilometres (20 miles) from the heart of Canadian. Another alternative is the AmericInn Lodge & Suites McAlester, which can be found 30 kilometres (19 miles) away. Another option is to make a booking at the Best Western Eufaula Inn or the Oak Tree Inn McAlester. If you are keen to see some more of the mountains and prairies that feature in this area, you might also book a few nights in other destinations in Southeast Oklahoma. You can travel to local places of interest or go mountain biking, rock climbing and abseiling and then book a convenient hotel. There are a number of accommodation options in Savanna, which is situated 45 kilometres (27 miles) to the southwest of Canadian. Hotel options here include the Knights Inn Savanna / McAlester and CandleLight Inn. If you are arriving or departing via Fort Smith Regional Airport, you can book a bed at Homewood Suites by Hilton Fort Smith, or Comfort Inn & Suites, both of which are conveniently located nearby. What are the most popular Canadian hotels? Are there hotels in other cities near Canadian? What other types of accommodations are available in Canadian? Explore Canadian with Expedia.ca’s Travel Guides to find the best flights, cars, holiday packages and more!